Sometimes the hardest part of any project is getting started. Whether it is getting the initial idea or just getting started implementing the idea, it takes that effort to launch the concept into an actual project. For LEGO Mindstorms builders, The LEGO MINDSTORMS EV3 Idea Book is here to help bring that initial idea from concept to actual build. 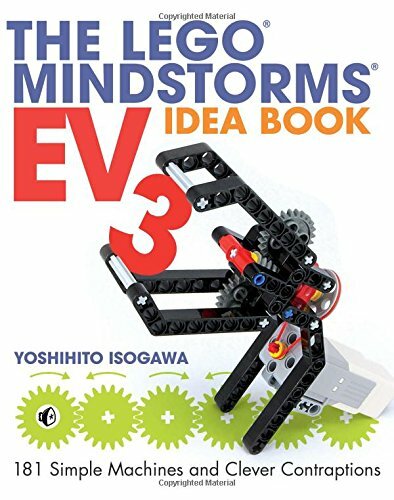 The LEGO MINDSTORMS EV3 Idea Book by Yoshihito Isogawa contains “181 simple machines and clever contraptions” that can help get any project launched. By giving simple machines that can be incorporated into larger projects, like robots, cars, buildings, and other creations. With the exception of the introduction, there are no words in the book other than chapter and project titles. As Isogawa explains in the introduction, it’s an idea book rather than a how to, and everything is shown in clear pictures from different angles to get a good grasp on how it was done without giving step by step. It’s an interesting design idea for the book, giving the reader the freedom to build what they want based on the creations in the book, giving them nothing more than pictures and some math for angles and gear ratios. The book does not teach or focus on programming. For the most part, each of the simple creations in the book can be tested with three programs that are given in the introduction of the book. Like the no words, the editorial decision to be able to run almost every project in the book is an interesting one, but one that works well. It gives the reader the chance to focus on the actual build rather than the process of building, programming, and testing. The LEGO MINDSTORMS EV3 Idea Book is a great place to find ideas for that next Mindstorms build. It starts out with very simple mechanisms and builds up to help build those more complex ideas. I have had robots I have wanted to build for a while, and I see different pieces in the book that I can incorporate into my Mindstorms EV3 robots. I look forward to seeing what I can build using some of the machines and contraptions in the book.